Growing up I never had the pleasure of being close to my cousins. I was pretty much the only girl in a family full of boys, with the exception of two older girl cousins. While I was playing with dolls, they were dating boys. I was a bit envious of all the fun my brother had at cousin sleepovers or outings that I was never allowed to attend. I always wanted that close relationship with a family member that wasn’t a sibling. Because, let’s face it, living with family is way different than choosing to spend time with them. Until a year ago, I never knew the close friendship that could develop between cousins. I speak of a cousin by marriage. I have been so blessed to find a best friend right in my back yard. We share a love of reading books and collecting books (yes, they are different), exchanging snail mail, family, chickens and who knows what else. When we get together we love to sit and watch the ‘little cousins’ whispering in the corner about some mischief that is about to take place. We talk about how wonderful it is that our children are going to grow up together. I am very blessed to have found a life long friend. For this postcard, I started with a PaperArtsy postcard base. I then covered the postcard with used tea bags and stenciled with the Collage, Textures Patterns,Circles. I used dictionary paper, a Rolodex card, paints, stamping, thread, and fibers to embellish. I used a Japanese wave stamp and script stamp in the background along with some white embossing. I am joining all the ladies for tea day over at Elizabeth and Bleubeard‘s. I am sharing my mug of green tea next to my newest plant, a crassulass succulent. It has some interesting finger-like suckers that drew my attention immediately, My son also thought it was cool looking and urged me to get it. So, this interesting creature came home with me. Here is a better picture from the net. My picture is somewhat dark as it was taken during one of our many rain showers today. In fact, it is supposed to rain all this week. There has been a lot of flooding in our area already but thankfully we live on the ridge of a mountain so we are staying mostly dry. Hi, Kate. That is fabulous post card art! Love your cousin story that goes with it. I was blessed to have grown up with two cousins who were sisters. My mother and their mother were cousins and were close like sisters. Our parents would get together and my sis and the two cousins would play together. We stay in contact now that all our parents are gone, but all four of us are spread out in three states. A neat cousin quote is “ cousins are those childhood playmates who grow up to be forever friends.” Another one is really good but can’t quite remember it. Manyway lovely post about cousins! Happy TDay! Your mail art postcard is gorgeous. What impressed me was how well you stenciled the area over the tea bags.. I would have trouble with that because of the uneven surface, It is a fabulous entry and those paper dolls are so impressive. I love the layers you create, too. Beautiful postcard Kate- I do love that color combo! That is a unique looking succulent for sure. Happy T day! It is a fantastic postcard you created, super layers and detail. It is good to find a friend or relative that we can become close to. It may take years for us to find them, but they become the family we choose for ourselves. your new plant looks interesting and such a vibrant green shade. I like the texture you get on your cards. I have never had luck with succulents. That is an interesting addition to your plant family 🙂 Happy T Tuesday! A really gorgeous post card! a wonderful reminder that childhood friendships can be precious…love those sweet little girls and the beautiful layers on this card! Cute succulent too….I got the urge to get a spoon jade last year, and I love it. I think the ends of each branch flare out a bit more than the one you show here. A life long friend is defiately special-I have not had one over the years except for my blogging friends. Love your gorgeous tactile postcard, such a wonderful way to use teabags! My father’s family moved to the US while he stayed in Europe, so I never was close to my cousins from his side. My mum was the 11th of 12 children and my numerous cousins from her side were all much older, but I admired them from afar…. You are lucky to have found such a close friend in your husband’s cousin! Really, Kate, you inspire me no end! This is an amazing tactile piece with such beautiful colors, and a wonderful way to celebrate your blessing of a lifetime friend! I so enjoyed reading your post and have missed your lovely blog posts while I was away. We are enjoying a week of rain, too, and my garden is so soggy and sad looking. We are in a low area and flooding badly. Happy to have a watertight roof over my head! Sending hugs! 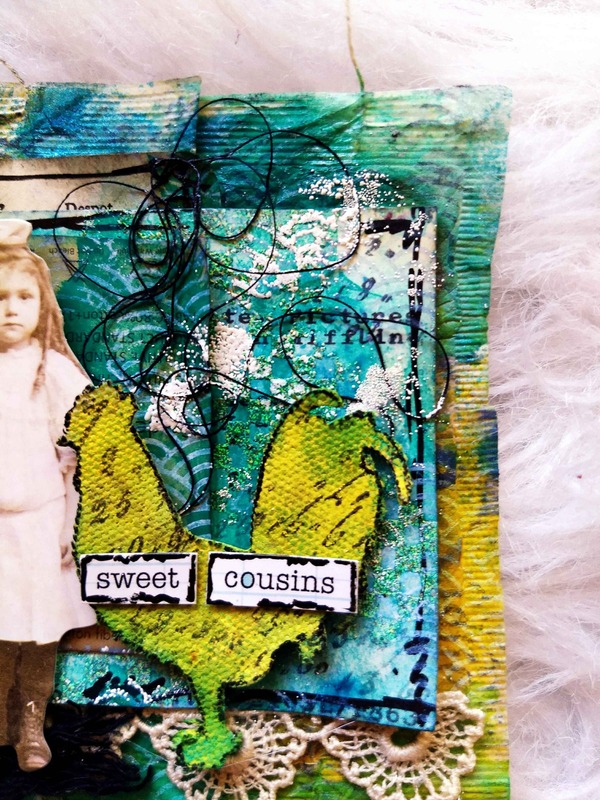 Your card is a beautiful tribute to “sweet cousins.” Gorgeous layering! Your mail art postcard is simply gorgeous. You are such a pro! What a fantastic make! I love your cousin art piece so much, it so speaks to me as I love my cousins ( 2 female, 2 male so much as well as I was a single child and grew up with theme so wonderful! I love your mermaid mug and that stunning plant, too. Your postcard is very special. A real work of art. I don’t suppose you are sending that in the mail. Frame it more likely. My hobby is postcards but yours are in a league of their own. What an unusual succulent. I have not seen this one before. How gorgeous is this mail art!! truly love your layers and the depth you have created with those colors! I have been fortunate to grow up with close cousins and still have times together and lots of awesome memories!